I hate the Summer! There, I said it! I spend the vast majority of the sunshiny months in an epic huff, demanding that people stay out of my personal space and frowning angrily while clutching an ice cold bottle of water in my clammy little hands. Luckily my nearest and dearest know how to handle me when the mercury starts rising. More often than not, I can be tamed with a simple ice cream cone at the breezy Northern seaside. 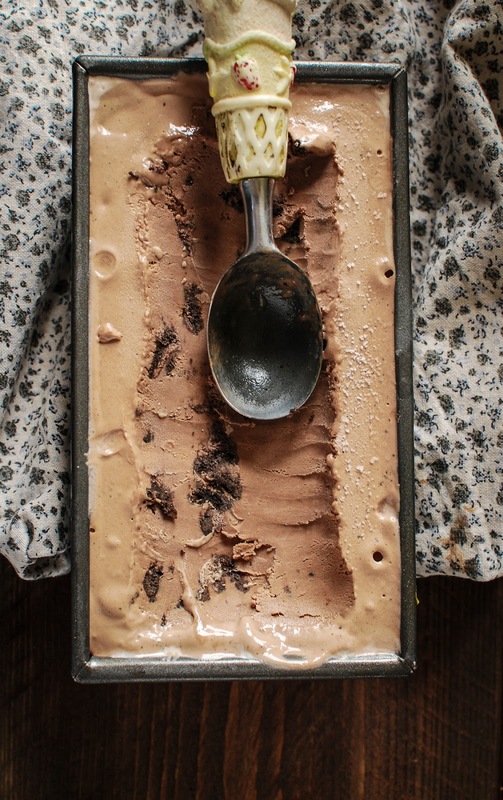 Since we’ve been experiencing what can only be described as tropical storms this year, I’ve had to settle for this homemade malted chocolate and Oreo ice cream instead of my usual cone. Not that I’m complaining mind. This summer, work commitments and insane storms have meant I’ve been unable to make many trips to the coast; the few evenings and afternoons I’ve had spare have seen thunder and lightning like I have never seen before. This means I’ve had to make my own ice cream, plop it in a waffle cone and happily lick away while watching the heavens light up from the comfort of my living room. Normally, if I’m out, I’d never go for a chocolate ice cream. 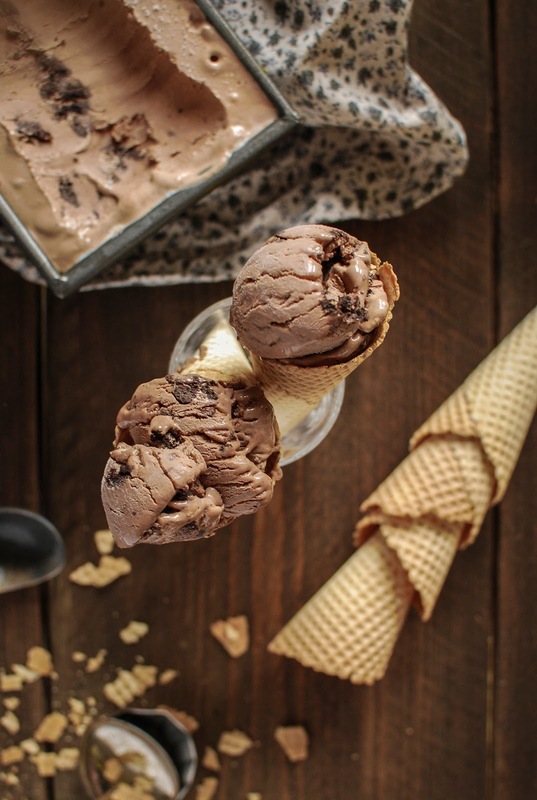 I’ll always favour a fruity number over a chocolatey one, but homemade chocolate ice cream is different. It’s so much more delicious than a store bought variety, richer and smoother. I seriously can’t sing its praises enough, add some chocolate stuffed Oreos into the mix and this baby is just heavenly. I can see a lot more home made ice cream in my future, I just hope you’ll allow me to share my frozen adventures. 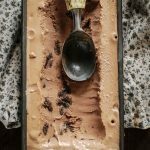 This malted chocolate and Oreo ice cream is so much tastier than store bought chocolate ice cream. You’ll never look back. To make the base custard bring the milk and cream to a simmer in a small saucepan. Once the milk is simmering whisk the egg yolks with the sugar till creamy. Pour the warm milk onto the eggs, whisking constantly. Pour the custard back into the saucepan and cook over a low heat for 10 minutes, whisking constantly. The custard is ready once it’s thick enough to coat the back of a wooden spoon. Once thickened, place the chopped chocolate in a large bowl and pour over the hot custard. allow the chocolate to melt and stir in, add the Ovaltine and mix until combined. Pop the bowl in the fridge for a few hours to cool completely. Once cool churn the custard in an ice cream machine, following the manufacturers instructions. Once thick and creamy, transfer to a freezer proof container and freeze until ready to serve. If you don’t have an ice cream machine just pour the custard into a large freezer proof container and place in the freezer. Every two hours stir the ice cream with a fork, after around 6 hours the ice cream will be ready. This looks really good! At what point do you add the Oreos? Ooops, add the oreos just as the mixture is ready to decant into the freezer proof container. Just give a little mix to ensure they're evenly distributed.